The metro network is a diverse on-ramp for residential, enterprise and wireless services. A mix of Ethernet, IP and TDM services converge in the metro on a unified IP/MPLS network for transport to the IP Core. 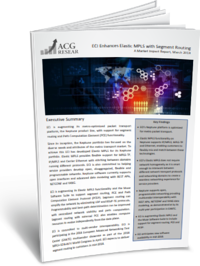 With the evolution to fiber-deep architectures for 5G bandwidth growth continues unabated. ECI’s Neptune platform is set to meet the challenges of the new metro. Read the latest Market Impact Report by ACG Research's Tim Doiron to learn more. Click here to learn more about ECI's Metro-Aggregation Solutions.